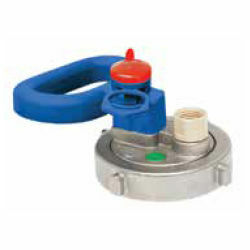 Brass valve with knob and female coupling for ABF - Wet Chemical fire extinguishers with internal cartridge. Inlet thread Μ 74 x 2 mm. Outlet thread Μ 18 x 1,5 mm. Dip tube thread Μ 16 x 1,5 mm.